The Federal Accounting Standards Board (FASB) requires that all companies must expense the value of the share based compensation issued to their employees in accordance to ASC 718 (formerly known as SFAS No. 123). Is applied in a manner consistent with the fair value measurement objective and the other requirements of ASC 718. Is based on established principles of financial economic theory and generally applied in that field. The valuation of a private entity is often derived through the Black-Scholes Model. 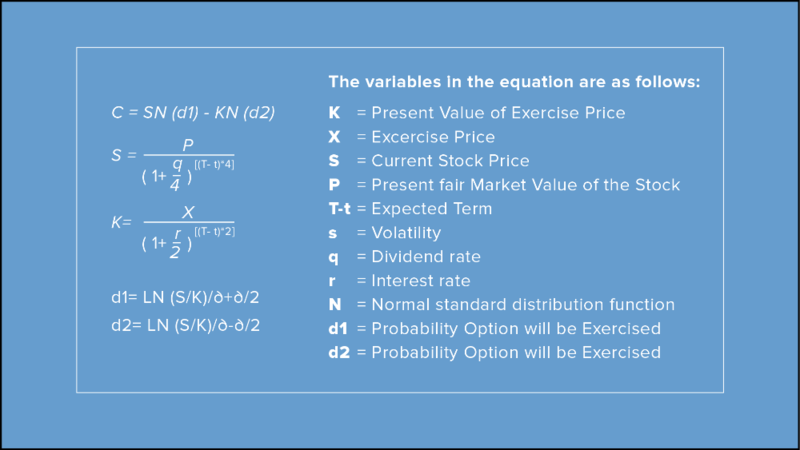 The Black-Scholes Model is one of the most commonly used option pricing models in the financial industry. The greatest strength of the BSM is its simplicity. The model works by entering fixed inputs (note above) into a formula to compute the value of an option. In the next few articles, we will be breaking down each of the factors that the Black-Scholes Model is composed of and how Carta computes these numbers. Note: Carta assumes the dividend yield for all private entities to be 0. As a result, there will be no article explaining the matter.